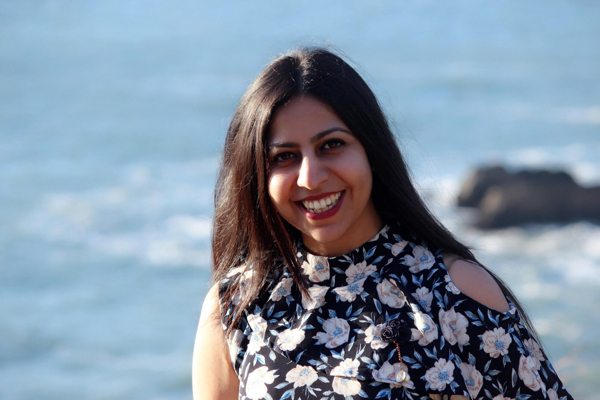 Dr. Vardayani Ratti, a John Wesley Young Research Instructor in Mathematics, is currently teaching a Topics in Applied Mathematics course. When describing her research areas to students in this class, Dr. Ratti says the topic of honey bees consistently sparks interest. Dr. Ratti studies the western honey bee (Apis mellifera) and its vulnerability to viruses caused by the parasitic mite, Varroa destructor, which has been considered one of the main causes behind losses of honey bee colonies. Apis mellifera, female and male. Click for larger images. Photo credit: The Packer Lab, http://www.yorku.ca/bugsrus/PCYU/PackerCollection. Her research involves mathematical modeling to study disease dynamics in colonies and how varroacide treatment affects the population. For example, Dr. Ratti's models show that without varroacide treatment, a colony infested with mites can thrive for years without any noticeable change, and suddenly dies off when the virus begins growing. The results are in agreement with the observations of beekeepers. Dr. Ratti also studies the division of labor in colonies. 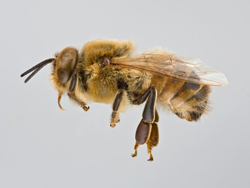 Young worker bees begin by performing tasks inside the hive, but are then recruited as forager bees as they get older. "When there's a surplus of foragers, recruitment slows down. A surplus of hive bees causes increases recruitment of foragers," she says. "I was amazed to learn how smart they were." 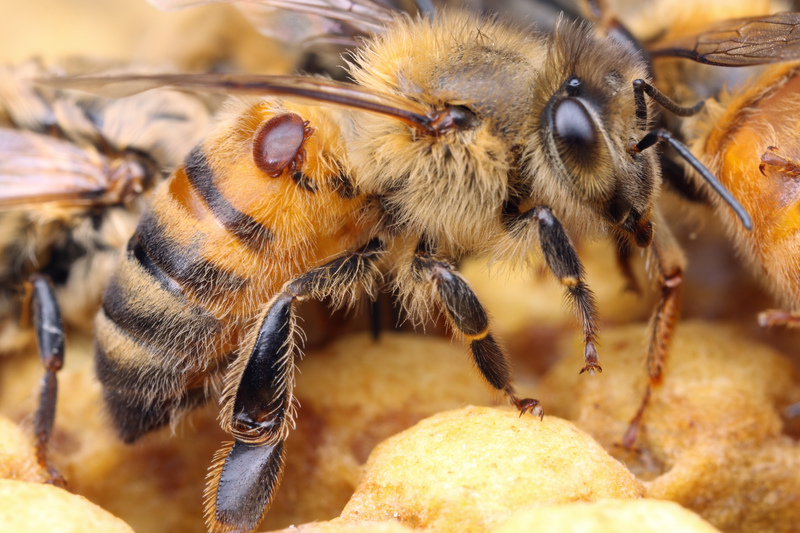 The close study of this division of labor enabled her to change the mathematical model to account for the loss of foragers due to pesticide exposure. 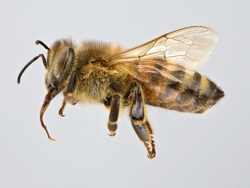 "Pesticides affect the bees' navigational skills," she says, potentially causing homing failure among foragers. Follow-up research led to publication of a paper in the Bulletin of Mathematical Biology. The published paper, which combines mathematical models of disease with division of labor models, uses computer simulations to examine how the interplay of Varroa mite infestation and forager loss affect colony survival. The results suggest that such computer simulations may be a useful tool for agricultural policy. 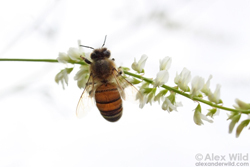 Apis mellifera foraging on white sweet clover, and with Varroa destructor mite. Click for larger images. Photo credit: Alex Wild, http://www.alexanderwild.com. Dr. Ratti's enthusiasm shines through as she describes the paths which led to this research — her undergraduate training in pure math, receiving her Master's degree and Ph.D. at University of Guelph, and field work at the Missouri Botanical Garden, where she worked to train bees to recognize colors — and her passion for teaching and research continues here at Dartmouth. Most recently, she was an invited speaker at the Fields Institute's Workshop on Pollinators and Pollination Modeling. Other projects of Dr. Ratti use mathematical modeling to study (1) treatment of HIV with a population of gene edited hematopoietic progenitor cells; (2) reduction of mosquito abundance via indoor wall treatments; (3) the effect of habitat diversity on the population dynamics of Anopheles gambiae; and (4) the effect of land use and topography on malaria transmission. She is collaborating with Professor Dorothy Wallace. Dr. Ratti is currently supervising an undergraduate under The James O. Freedman Presidential Scholars program and co-supervises two undergraduate theses with Professor Wallace. Her research is funded in part by NSERC-CANPOLIN as part of the Canadian Pollination Initiative and NSERC-ENGAGE.